Ultra-thin Teijin material covers the top of the foot, with the Flywire technology attaching to the outsole and holding the foot in place – key to a runner, a basketball or a football player. As the game is getting faster, keeping control of the ball at speed is crucial for the Mercurial player. Gathering insights from our key assets, we’ve identified the key speed touch area and have applied a special coating to the upper of the boot in order to improve grip. The strength of Nike Flywire technology can be found in strategically placed filaments acting like cables on a suspension bridge and offering support precisely where a foot needs it. These strong filaments allow for a minimalistic shoe upper, reducing weight to help create Nike’s lightest shoes ever. Further refinement with help from biomechanics experts in the Nike Sports Research Lab resulted in optimal placement of the filaments. Ultra-thin Teijin material covers the top of the foot, with the Flywire technology attaching to the outsole and holding the foot in place – key to a runner, a basketball or a football player. 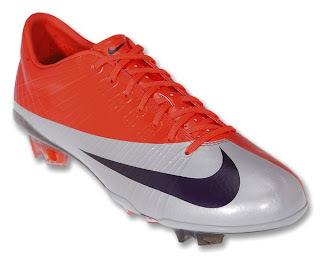 The Mercurial Vapor Superfly is the lightest football boot Nike has ever made. Flywire technology allowed the shoe to be stripped of all unnecessary pieces without compromising durability. 10 grams lighter than the first generation, the Mercurial Vapor Superfly’s revolutionary outsole combines a 3 layers / 12 bars carbon fiber TEPEX® thermoplastic chassis engineered for flexibility (forefoot) and stiffness (arch), with direct Injection molded studs. The 12% weight reduction was achieved by coring-out the 4 heel studs as well as 4 of the forefoot ones. The direct injection process becomes clearly visible with the studs structure being called-out in the signature NIKE Max Orange. Not only these studs are lighter, but they also are stronger and more durable.